The Spoked Traveller | Hiking North Africa’s Highest Peak! Hiking North Africa’s Highest Peak! 08 Nov Hiking North Africa’s Highest Peak! Me, two guides and a donkey. 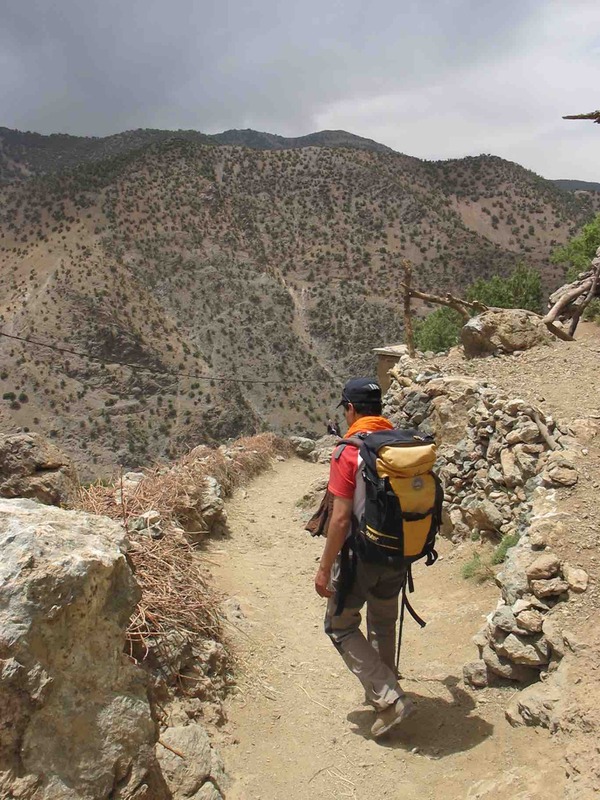 This story recounts the hike, but not the hormonal 20 something guide. Oh my, there’s always a story-behind-the-story. Amazing hike nonetheless. movie, Kundun, because it looks like Nepal. its path. Today, cement dams segment the river. Rain seems inconceivable in this heat. nothing here: desert or flood. mountain and on the other, terraces of vegetables. the little ones huddle around her legs to listen. deep sleep and have 1,000 dreams. to the north. “We drink this like five times a day. We call it Berber whiskey!” says Abdel. runs behind us; it’s the first sign of tourists. After dumping our stuff, we head to the waterfall and dunk our hot feet. pot of bubbling cumin and peppers steams up the windows. then come across a gaggle of mules and hikers. This is disheartening. like a true traveller and not a tourist who bought a package. Somehow, the hikers mention beer. “Oh, I wish,” says a Polish woman. looks like Nepal: it’s the last stop before the final ascent. I hear people leaving the dorm around 5 a.m. to get ahead of the rush. a group of school kids hanging from the summit’s triangular steel tower. the surrounding mountains popping through the clouds. the calm disappearing, or do they even notice?